Car Audio City is a one-stop shop for car stereos, amps, audio systems, subwoofers and more. We offer professional audio system installation in San Diego. When it comes to your car stereo system, you only want the best. You want that bumping sound system that will have you jamming to you favorite music while cruising around San Diego. That is why you need to come to Car Audio City in San Diego. We carry the best brands in car speaker systems and offer unparalleled installation. To get started, give us a call at (619) 494-3434. Car Audio City has an amazing reputation around National City from our years of quality installation, top notch customer support, and the high quality of products we carry. 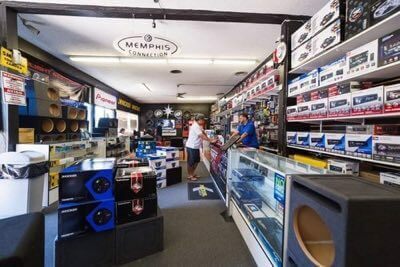 We have been a reputable dealer of quality car audio systems and car stereo systems in National City for many years, satisfying customers with each and every job. No matter what your car stereo preference is, we can make it happen with custom installation that looks amazing! At Car Audio City, you can afford to upgrade to the most up-to-date technology. With almost everyone having a smartphone nowadays, it is essential to have a bluetooth stereo system that can connect with your iPhone or Android. We offer stereo systems that will seamlessly connect to your smartphone, enabling you to play your favorite music app while driving in National City. With help from the experts at Car Audio City, you can jam out to Pandora, Spotify, Apple Music, YouTube, iHeart Radio, Podcasts and more with ease! Browse systems that include Bluetooth, iPhone/Android compatibility, MP3/WMA compatibility, USB ports, and are app enabled for Spotify, Pandora, iHeartRadio, and more. Car Audio City proudly offer these trusted brands only the most trusted brands at our National City location. When it comes to car stereo system, you should only have the very best brands for your speakers, subwoofers, amplifiers, head units and more. That is why we offer a wide range of different car stereo brands. If you are ready to upgrade your car stereo with an aftermarket car speaker system with amazing brands in car audio, come to Car Audio City! Car Audio City is ready to get you the sound system in your car that you deserve. Contact us today by giving us a call (619) 494-3434. Also, make sure to check out our Specials page to see our great monthly deals on after market audio systems.